On Thursday 28th January, 3CW were invited to take part in a gym and dance performance at Saffron Walden County High School to showcase their talent to 11 other schools from the area. The children watched with interest as the other acts performed their piece, growing ever more nervous as they waited for their turn. Having saved the best until last, and with the biggest cheer, 3CW finally took to the stage and danced to High School Musical’s ‘All in this together’ beautifully. All schools did extremely well and a great time was had by all. If you missed the performance, check out the pictures of us practicing and performing on the night. 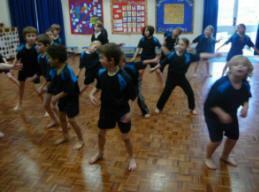 A big thanks to Tamzin who taught us the dance.